Holidays! Who doesn’t like them? We have a tendency of checking the list of holidays at the beginning of every calendar year. Why so? That’s because we usually plan on vacations based on them. What could be better than being able to squeeze in a day or to extra into the tour plan. This is why we have decided to come up with this article that will give you the list of all holidays for the calendar year 2018. 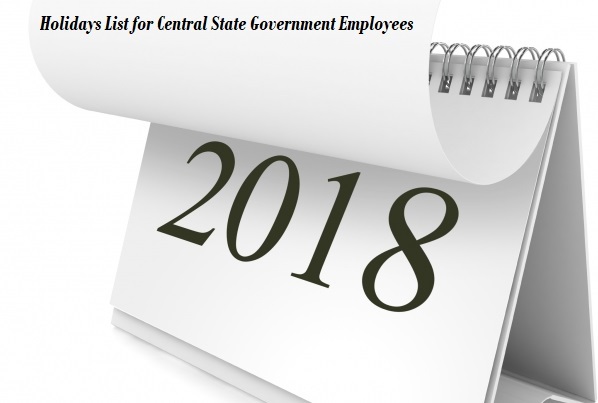 It is going to be a long article because we will separately list all holidays for Central and State Governments. To begin with, we will look at the Centre approved holidays at first. We will also look at the conditions laid down by the government for such holidays. Though the article will be long, we hope you will be enjoying it because it is all about holidays! If a holiday falls on a weekend, no substitute will be granted. If a holiday falls on a non-working day (not weekend), no substitute will be granted. Dates for Muslim holidays may change depending on moon sighting. If Muslim holidays change on a very short notice, notifications will be given through A.I.R, TV or P.I.B. or newspaper. Under such circumstances, Central Government Offices and Department Heads need not wait for any formal order. There are states where Diwali is celebrated a day ahead of the actual Diwali Day. It is known as Narakachaturdasi Day. In such states, Narakachaturdasi Day should be the official Diwali Day. Next day, i.e. the actual Diwali Day should be a working day. List of holidays for Union Territories should be decided by their respective administrations but in accordance with instructions issued by Home Affairs Ministry. Apart from National Holidays as observed by Central Government, banks remain closed on the public holidays celebrated by different States and Union Territories of India. This means that the banks in different States and Union Territories of India enjoy different regional holidays as mentioned in the list above (State Government Holidays). That’s the entire list of holidays for 2018 in India for Centre, States (and Union Territories) and Banks. We do not guarantee that the information in this article is accurate. There may be human errors. In case you spot some error, feel free to drop us a message through the comments section and we will fix the same after validating with authentic sources.